This online calculator will help you to find angle between line and plane. Using this online calculator, you will receive a detailed step-by-step solution to your problem, which will help you understand the algorithm how to find angle between line and plane. 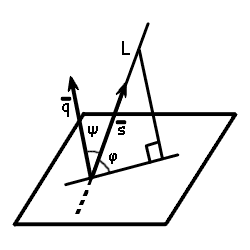 The angle between line and plane is the angle between the line and its projection onto this plane. See else: library: angle between line and plane.